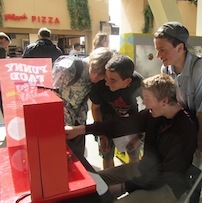 Math Midway 2 Go (MM2GO) is a suite of six interactive mathematics exhibits available for presentation at a wide variety of venues including schools, community centers, science festivals, and libraries. 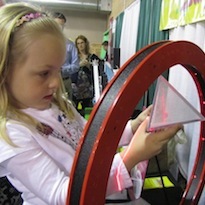 Hands-on activities captivate and engage visitors, highlighting the wonder of mathematics. MM2GO is created by the National Museum of Mathematics and is based on six exhibits from the popular hands-on Math Midway exhibition. MoMath is pleased to acknowledge the support of the Alfred P. Sloan Foundation in the creation of Math Midway 2 Go, and the support of the PSEG Foundation in the creation of the accompanying curriculum.